It's Oregon Craft Beer Month. You may have heard. As much as it's a time to celebrate the terrific beer culture we have, it's also a good time to look back at how we got here. If you've been around long enough, you remember when the craft beer scene here wasn't all that big. One of the things I have long-assumed is that, even with the growth in the number of breweries and in the volume of beer produced, the largest breweries dominate the industry in Oregon. In fact, OLCC stats show something else. For comparison, I looked at the OLCC reports for December of 2005 and 2014. Roughly 10 years. I used the December reports because they provide the best look at what Oregon breweries are doing on an annual basis. The first thing to note is the increase in production, from 263,637 barrels in 2005 to 581,151 barrels in 2014. That represents more than a doubling in production, which is significant, but not the whole story by any means. 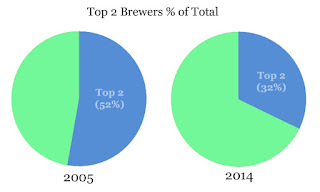 Another interesting factoid, not shown in graphic form, is the increase in reporting breweries...from 64 to 203. We've more than tripled our brewery count. Widmer (aka the CBA) and Deschutes have occupied the top spots on the OLCC reports for many years. If you go back to the early days, that was Full Sail's spot. I do not know when that changed; probably in the 1990s when craft beer in packaged form gained popularity. Anyway, my assumption regarding the dominance of the top breweries was stomped on out of the gate. In actual fact, Widmer and Deschutes have seen their combined share of total Oregon production decline over the past decade, from 52 to 32 percent. Don't be fooled. Deschutes and Widmer still produce far more beer than anyone else. 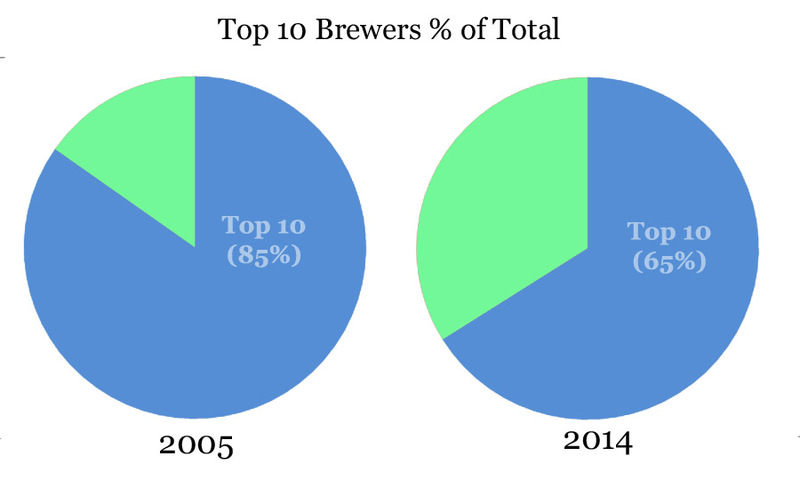 It's just that there are many small and medium-sized breweries doing well. 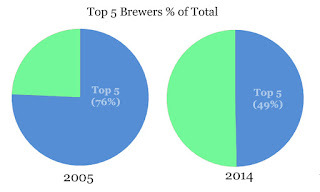 At the end of 2005, only 24 breweries produced 1,000 or more barrels. By the end of last year, 64 had reached that level. Sea change. It's a similar story when you look at the top five. That group has changed slightly since 2005, when it included Deschutes, Widmer/CBA, Portland Brewing (aka Mac's), Bridgeport and Full Sail. By the end of last year, Ninkasi and 10 Barrel had nudged Bridgeport and Full Sail out of the group. Regardless, the top five's percent of total production declined significantly, from 76 percent in 2005 to 49 percent in 2014. It's fairly easy to see why. It isn't just because we have a lot of breweries producing more than 1,000 barrels annually; it's because nearly half of the breweries hitting that number are producing more than 2,000 barrels annually. One more comparison is the top 10 vs. total production. 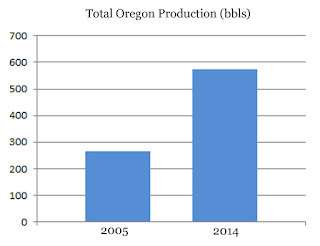 This is a dominant group, accounting for 85 percent of Oregon production in 2005. Yet by the end of last year, the top 10 percentage of a much larger pie had declined to 65 percent. There is no mystery as to why. The top 10 is producing a lot more beer than it was in 2005. But there are simply a lot of smaller breweries doing well. In 2005, Laurelwood finished tenth with just over 2,000 barrels production. The tenth place brewery for 2014 was Boneyard, which produced over 14,000 barrels. You can take it from there. There are some things to keep in mind. Most importantly, OLCC stats only track beer made and sold in Oregon. Beer shipped out-of-state doesn't show up in OLCC stats. Beer shipped into Oregon doesn't show up, either. In effect, OLCC stats are fairly limited. I've talked about this before. Deschutes and Widmer illustrate the true reality nicely. They have a combined capacity of around a million barrels a year. Yet only a fraction of that beer shows up in OLCC stats. Why? Because a lot of the beer these guys make is exported and doesn't register in OLCC stats because it isn't sold here. Widmer's case is otherwise unique because it has breweries outside Oregon. Some of the beer they sell here is produced, for instance, at their brewery in Woodinville, Wash. That beer doesn't show up in OLCC stats because it isn't produced in Oregon. In other words, about the best thing you can say about OLCC numbers is they provide a glimpse into what's happening in Oregon. That glimpse suggests non-behemoth breweries are doing pretty well, making progress, in fact. Just remember those conclusions are based on stats that are incomplete and limited in scope. In reality, the big guys still rule Oregon beer production by a large margin. They just don't sell it all here.